- Kipling is the first Englishman to be awarded the Nobel Prize for Literature; he commands a place amongst the finest of English writers. What would be more enjoyable than a bunch of quirky poems and fantastic fable-like stories -- that could tease our excitement, fears and anxiety? 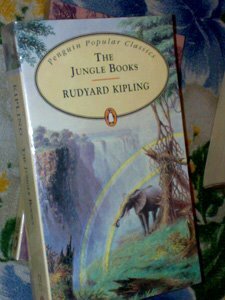 There is one classic collection of stories that offers these perks: The Jungle Books. Adventure is always a thing for reader who wanted fun, dreaming to relive the story on his own imagination, making himself the main character. This is what I mostly do when I was young: placing myself on the situation of the characters thinking that the story is mine. Yes, I hoped to become a character of classic stories and by reading I could become one. You know what, another parameter to see whether a book is too good or not is the existence of any adaptations, TV shows, movies and stage plays. Who would forget Disney's take on Mowgli's story.